Water may be one of the most abundant compounds on Earth, but it is also one of more mysterious. For example, like most liquids it becomes denser as it cools. But unlike them, it reaches a state of maximum density at 4°C and then becomes less dense before it freezes. In solid form, it is less dense still, which is why standard ice floats on water. That’s one reason why life on Earth has flourished— if ice were denser than water, lakes and oceans would freeze from the bottom up, almost certainly preventing the kind of chemistry that makes life possible. None of these explanations are entirely convincing, which is why the true explanation is still up for grabs. Today Xi Zhang at the Nanyang Technological University in Singapore and a few pals provide one. These guys say that the Mpemba paradox is the result of the unique properties of the different bonds that hold water together. What’s so odd about the bonds in water? A single water molecule consists of a relatively large oxygen atom joined to two smaller hydrogen atoms by standard covalent bonds. But put water molecules together and hydrogen bonds also begin to play an important role. These occur when a hydrogen in one molecule comes close the oxygen in another and bonds to it. Hydrogen bonds are weaker than covalent bonds but stronger than the van der Waals forces that geckos use to climb walls. Chemists have long known that they are important. For example, water’s boiling point is much higher than other liquids of similar molecules because hydrogen bonds hold it together. But in recent years, chemists have become increasingly aware of more subtle roles that hydrogen bonds can play. For example, water molecules inside narrow capillaries form into chains held together by hydrogen bonds. This plays an important role in trees and plants where water evaporation across a leaf membrane effectively pulls a chain of water molecules up from the roots. 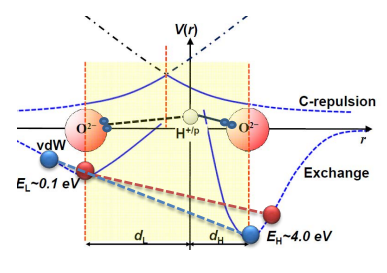 Now Xi and co say hydrogen bonds also explain the Mpemba effect. Their key idea is that hydrogen bonds bring water molecules into close contact and when this happens the natural repulsion between the molecules causes the covalent O-H bonds to stretch and store energy. But as the liquid warms up, it forces the hydrogen bonds to stretch and the water molecules sit further apart. This allows the covalent molecules to shrink again and give up their energy. The important point is that this process in which the covalent bonds give up energy is equivalent to cooling. In fact, the effect is additional to the conventional process of cooling. So warm water ought to cool faster than cold water, they say. And that’s exactly what is observed in the Mpemba effect. These guys have calculated the magnitude of the additional cooling effect and show that it exactly accounts for the observed differences in experiments that measure the different cooling rates of hot and cold water. Voila! That’s an interesting insight into the complex and mysterious properties of water, which still give chemists sleepless nights. But while Xi and co’s idea is convincing, it is not quite the theoretical slam dunk that many physicists will require to settle the question. That’s because the new theory lacks predictive power—at least in this paper. Xi and co need to use their theory to predict a new property of water that conventional thinking about water does not. For example, the shortened covalent bonds might give rise to some measurable property of the water that would not otherwise be present. The discovery and measurement of this property would be the coup de grâce that their theory needs. Does Your iPhone Have Free Will?